Try these sneaky suggestions to get your toddler to eat all the good stuff he needs. 1. Offer it when they're hungry. 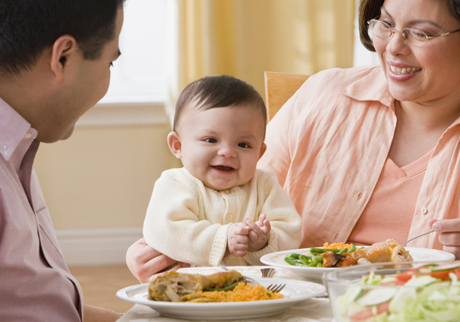 Seems obvious, but many parents forget to introduce new foods when appetites are peaking. When your child's in the throes of hunger, pull out something nutritious that's new to his food repertoire. 2. Keep it small. Large servings can overwhelm toddlers, setting off their alarm bells. Also, pint-sized diners tend to feel more comfortable with small plates, cups and junior cutlery. 3. Cut it up. Some kids wouldn't think of chomping into a pear but will eat it peeled and sliced. Ditto for veggies. Nowadays many supermarkets carry not only washed and peeled carrots, but rutabaga and celery sticks, too. 4. Hide it. Sneaky parents hide an extra veggie or two in spaghetti sauce, nachos, shepherd's pie, soup or chili. If Junior has a keen eye, purée veggies before you hide them. Consider concealing grated carrots and zucchini in quick breads, cookies or meat loaf. Muffins are perfect for pumpkin, bananas and applesauce. 5. Freeze it. Children will often warm up faster to a food that comes out of the freezer, than the oven - especially if it's summer. You can freeze slices of mango, peaches and pineapple or a whole banana on a popsicle stick. Many kids will eat a frozen pea before they'll eat one cooked. Frozen blueberries are easy, cheap and nutritious. 6. Dip it. Call it the age of grazing, but some kids just love to kick back and dip their way through a meal. A bottle of low-fat, creamy dressing can do the trick for most raw veggies. Or blend some yogurt with mild salsa or dried soup. Entice fruit dippers with sweet cream cheese, applesauce or chocolate sauce for special occasions. 7. Sprinkle it. Just a light dusting of cake-decorating sprinkles can do magic. Whether it's applesauce, plain yogurt, fruit salad or berries, it all seems to go down faster with a little shake or two of sprinkles. 8. Sauce it. A little bit of ketchup (ok, a lot) can go a long, long way. Apparently kids aren't equipped with the same supply of saliva as adults, so dry textures in meats can be difficult to swallow without sauce. 9. Rename it. It's all semantics but many parents swear that names count - not broccoli, but "trees"; not raisins, but "flies"; not tortillas, but "blankets"; not noodles, but "worms." Others spin magical tales (such as "This is Batman's favourite food in the Batcave") that get the imagination flying and the jaws in motion. 10. Liquefy it. This trick works particularly well with thirsty kids. Get out a juicer and experiment. Carrot juice is often a pleaser, whether plain or mixed with apple or pear juice. Let kids try their own combos, but beware: Bananas, avocados and other very soft fruits do best in a blender, not a juicer.